In my constant search for the hidden histories of the UK, I have come across all kinds of books, websites, records, places and people that fall outside of mainstream discourse; they make up a fascinating counter narrative that I'm having to piece together bit by bit. What I learnt at school didn't help that much, and neither does the mainstream press. 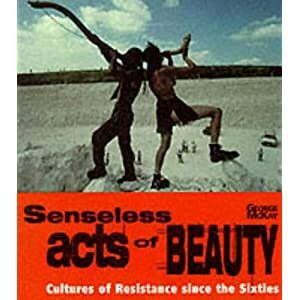 I came across George McKay's excellent book 'Senseless Acts of Beauty' in a rather round-about way; reading the liner notes 'May Inspire Revolutionary Acts' by The Mob (excellent eighties anarcho/traveller band, who were part of the squatted community in Brougham Road, Hackney) it mentioned the book in positive terms, only criticising the fact that it was rather myopic when it came to the phenomenon of underground punk rock in the eighties; only Crass get a look in. Having now read it, I have to agree that this is true (so go pick up 'The Day the Country Died' by Ian Glasper to fill in the gaps). Dutifully/obsessively I tracked the book down (finding out it was published by the ever excellent Verso Books) and was mightily impressed and enlightened. McKay tracks the history of underground youth movements and protest from the end of the sixties; still, even now, often the focus when any meaningful discourse about these things takes place in the mainstream. Presumably becuase those same Baby Boomers who flirted with being hippies ended up in various positions of power in the media, and could safely assess their semi-revolution from the comfort of old age and a decent career in the mainstream. Things, obviously, did not stop there. The book covers the period from the early seventies with the birth of the free festivals such as Windsor, and more famosuly the creation of the Stonehenge Free Festival by Wally Hope and Penny Rimbaud (later of Crass) in 1974, which would be smashed ten years later at the Battle of the Beanfield. McKay also tracks the Anglian Fairs and the cheekily titled, self-declared Free State of Albion. The threat of woolly and ill-defined mysticism hangs over aspects of the book, but by the time we get to the nineties road protests and the very real, sometimes dangerous and violent, (due to the actions of the boys in blue and private security firms) actions of the Dongas Tribe and Earth First! then this nebulous attachment to the Earth has solidified into something more tangible and politcally viable. 'The Dragon' becomes the perfect counterpoint symbol to rampant road expansion clearly fuelled as much by big business as by the Tories. McKay devotes an entire chapter to the phenomenon of Crass, something that I probably don't need to go into here but he does an admirable job of placing them in a wider framework of ongoing dissent and resistance, clearly showing that the division between punk and hippy was largely a fallacy and are different manifestations of the same thing. Crass are very important in the fact that they were/are one of the few bands to be a poltical force in their own right, with the music merely one component of what they were about; miles away from the empty revolutionary rhetoric of the first wave punk bands. It is true it would have been nice for McKay to focus on the anarcho-punk scene as a whole rather than just talking about Crass - Conflict are equally as worthy of study in a book like this - but he does a great job of linking the punk scene to the free festivals, the New Age travellers, and to the movements that came later, namely the rave scene. (He does, however, seem blissfully unaware that a number of veterans of the anarcho-punk scene became heavily involved the rave scene). Rave is an interesting one, as it was a largely apolitical youth movement, although one that quite clearly interwove with the other groups previously mentioned, and with the passing of the Criminal Justice Act in 1994 became effectively a criminal activity; the ironic knock on effect of that making the people involved become much more politicised. After spending the first few chapters focusing largely on musical movements, the book then turns its attention to the direct action movements of the early nineties. It mainly focuses on road protest such as the formation of the Dongas Tribe and the protest at Twyford Down against the expansion of the M3, and the infamous 'Yellow Wednesday' where private security used shocking brutality to move the protesters; as well as the upsurge in Earth First! action, and the events on Claremont Road in East London protesting the M11 link road. The book finishes with the passing of the Criminal Justice Act and the ramifications that had; the book was written in 1996 and obviously a lot has happened in the years between then and now, but this is an essential read for anyone interested in the history of the counter-culture in Britain, and an inspiration to anyone involved with the current protest movement - you realise you're not alone, and never were, rather you're part of a grand tradition that needs to be remembered and discussed. I'll end this article with an appropraite tune from Oi Polloi - 'Take Back the Land'.